With this book as their guide, readers will be able to configure and deploy Ubuntu Servers using Ubuntu Server 18.04, with all the skills necessary to manage real servers. 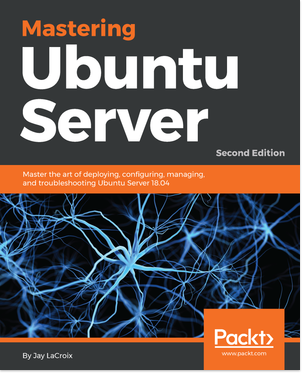 I am excited to have published the latest edition of Mastering Ubuntu Server, the book that was originally applauded as “clear, understandable, relevant, relatable, and jam-packed with good old common sense” and a “Must-have book for both the beginner and advanced“. I’ve worked six long months to write what I feel is a great way for you to learn how to use Ubuntu, all the way from the initial deployment to maintenance, teaching you along the way how to provision your server, deploy applications, manage containers, run virtual machines, and much more! In this new edition, I’ve updated the content from the original book to be compatible with Ubuntu 18.04, the distribution that is the majority server operating system today – and a wonderful platform on which to build and deploy your applications. I’ve added information on deploying LXD containers, managing configuration with Ansible, and much more! Download or buy today! Available from both Amazon and Packt!